Season 3’s first episode was released; Plus, Tobias would crush anyone on the production team at tennis! For a few thousand luck fans, “droughtlander” is over! 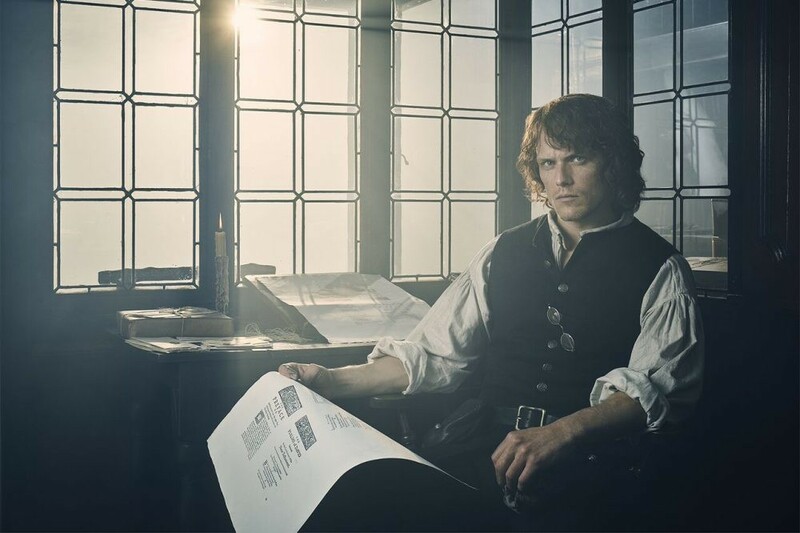 San Diego Comic Con is known for exclusive footage and Starz’ Outlander upped the ante by showing the entire season 3 premiere ahead of the September 10th air date! The show also provided fans with a look back at the first two seasons of the show, and some new production photos for season three. The panel was moderated by Jenna Dewan Tatum and included executive producers Ronald D. Moore and Maril Davis, newcomers Richard Rankin and Sophie Skelton and lead actors Caitriona Balfe, Tobias Menzies, and Sam Heughan. Let’s get a few fun facts we learned at the panel and just a touch of non-spoiler info about episode 1 of season 3! The Battle of Culloden was talked about extensively for season 2. We also mentioned ourselves it was a bit of a let down when we saw none of it in the season finale. But the season 3 delivers gut-punching emotion in the battle scenes, they’re everything we waited for and more. Tobias Menzies told the audience that everyone was excited to film the battle of Culloden because the history is so massive and rich. While not a forgotten moment in history, Menzies mentioned that it’s still not particularly well known. The cast and creatives care and attention were fully evident- the battle was heart rending. Caitriona Balfe’s season 3 mission was about being conscious of the challenge of playing Claire as she aged. 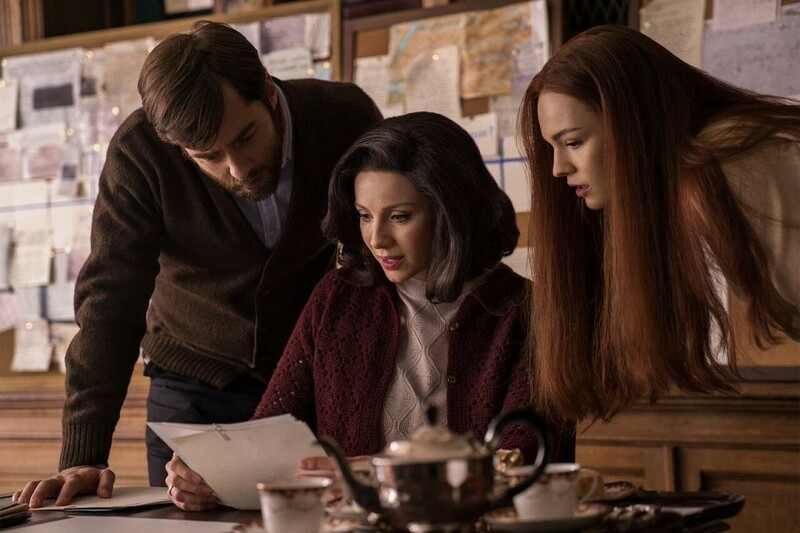 According to Balfe this season Claire’s journey will be about exploring how time and tragedy weigh on you. We already started to see hints of that in the episode. What the premiere did so beautifully was balance scenes between the past and Claire’s life in the present. Seeds were planted in both timelines that can be developed all season long and we’re definitely going to be looking for them! Tobias Menzies loved unpacking Claire and Frank’s life together in Boston which will be a departure from the novels as we don’t see much of that life together. Despite missing playing Black Jack, whom he insists would be a gas at parties. Tobias is always a standout actor. He was uniformly praised by Jenna Dewan Tatum (get in line, girl) and his performance in the S3 premiere was great. Even fans who aren’t huge fans of Frank might be convinced here. The cast, crew and creatives had a great time working on the Black Sails soundstages and tall ships for season 3. Even though moving the entire production was a difficult task everyone had a blast in South Africa. One of the most anticipated scenes of season 3 is the print shop scene. The print shop scene was written by Matthew B. Roberts and was very much written with the fans in mind as one of the iconic scenes of the third novel! It was also confirmed that Diana Gabaldon did not write any of the episodes for the third season. Newcomer Sophie Skelton revealed she auditioned for the role of Brianna way back in 2014 and thought she hadn’t gotten the roll before she received a call over a year later! everyone else chose to dance. Sam asked to dance with Channing Tatum and THAT we’d actually PAY to see. But we can watch him dance with Jenna here! One of the coolest parts of the panel? Hands down Graham McTavish crashing after he was finished with AMC’s Preacher Panel with a “Tulach Ard!” Not to miss out on the fun, Graham gave fans a little dance, too! The panel was GREAT FUN but the real talk here was that they dropped episode 1 of season 3. We had so many feelings and the episode was jam packed with everything we could’ve possibly wanted. Not much longer, Outlander fans! We can do it! And this episode will absolutely be worth the long Droughtlanter. We cannot wait until September 10th when you can catch our full, complete reviews and our Outlander roundtables!